Once again, US President Barack Obama has demonstrated his intention of “putting light” between America and Israel. His hostility toward Prime Minister Binyamin Netanyahu during the latter’s visit to Washington this week was breathtaking. It isn’t every day that you can see an American president leaving the prime minister of an allied government twisting in the wind for weeks before deciding to grant him an audience at the White House. It isn’t every day that a visiting leader from a strategically vital US ally is brought into the White House in an unmarked van in the middle of the night rather than greeted like a friend at the front door; is forbidden to have his picture taken with the president; is forced to leave the White House alone, through a side exit; and is ordered to keep the contents of his meeting with the president secret. Ahead of Obama’s meeting with Netanyahu, The Wall Street Journal reported that Obama was effectively attempting to blackmail the Israeli premier by conditioning the meeting on Netanyahu’s willingness to make tangible concessions to the Palestinians during his speech before the General Assembly of the Jewish Federations of North America. Obama’s hostility was evident as well during his meeting with 50 Jewish leaders at the White House this week. In an obvious bid to split American Jewry away from Israel, Obama refused to discuss Israel or Iran with the concerned American Jewish leaders. As far as Obama was concerned, all they deserved from him was a primer on the brilliance of his economic policies and the worthiness of his plan to socialize the American healthcare industry. His foreign policy is none of their business. Obama’s meeting with American Jewish leaders was supposed to be a consolation prize for American Jews after Obama canceled his first public address to American Jews since taking office. The White House claimed that he canceled the speech because his visit to the Fort Hood memorial service made it impossible for him to attend. But then the conference was a three-day affair. The organizers would probably have been happy to reschedule. Instead, as Iran races to the nuclear finish line, America’s Jewish leaders were forced to sit through White House Chief of Staff Rahm Emmanuel’s kitschy Borscht Belt schmooze about his bar mitzva. The ironic thing about Obama’s nastiness toward Netanyahu and his arrogant treatment of the American Jewish community is that while it has made him the first US president to have no credibility among Israelis and has caused a 14 percent drop in his support among American Jews, it has failed utterly to earn him the trust of the Muslim world. As for the larger Muslim world, a report this week in The New York Times stated that the US’s key Arab allies, Egypt and Saudi Arabia, have been perilously weakened since Obama took office. Their diminished influence has been accompanied by the rapid rise of Iran and Syria. Both of these rogue states have been on the receiving end of continuous wooing by Obama administration officials who seem ready to do just about anything to appease them. In the meantime, Iran’s Hizbullah proxy in Lebanon has again managed to regain control over Lebanon’s government, despite its defeat in June’s parliamentary election. Making full use of the fact that it fields the most powerful army in the country and owing as well to the US’s decision to abandon the pro-Western March 14 movement in favor of an approach that makes no distinction between America’s friends and foes in Lebanon, Hizbullah strong-armed its way back to the driver’s seat in the new Lebanese government. AS FOR Hizbullah’s Iranian bosses, far from convincing them to moderate their policies, the Obama administration’s efforts to appease the ayatollahs have emboldened Iran’s theocratic leaders to adopt ever-more radical positions against the US. As senior US officials try to make light of the fact that in the past week Iran has thrice rejected their latest offer to have the US, Russia and France enrich uranium for them, the Iranians announced that they will try three hapless American hikers for espionage. The three young Americans were abducted by Iranian security forces along the Iran-Iraq border in Kurdistan four months ago. The fact that Obama’s policies have all failed so spectacularly presents a unique opportunity for Israel to move its policies in a bold new direction. Many commentators and policy-makers have claimed that it falls on Israel to help Obama succeed where he has failed. In their view, Israel must go out of its way to establish a Palestinian state during Obama’s term of office or accept the blame for any renewal of the Palestinian terror war against it. Such voices – most strongly represented this week by French Foreign Minister Bernard Kouchner and New York Times columnist Thomas Friedman – have tried to blame the failure of Obama’s attempt to reinstate negotiations between Israel and the Palestinians on Israel’s alleged intransigence. In response to these allegations, this week Netanyahu expressed profound and urgent interest in holding negotiations with Abbas. This move was ill-advised. Although it is true that by proclaiming his devotion to the so-called peace process, Netanyahu was able to deflect some of the White House’s attacks against him, the short-term advantage it brought him this week in Washington is eclipsed by the long-term damage such an approach causes the country. In the long-run, Israel is harmed when its leaders promote the fiction that it is possible to reach an accord with the Palestinians that will bring about the formal and peaceful establishment of a Palestinian state. As Netanyahu prepared to fly off to Washington, Abbas made clear that he will not make any concessions to Israel for peace. Together with his fellow Fatah members, Abbas made clear that like Hamas, Fatah does not recognize Israel’s right to exist, does not support peaceful coexistence with Israel, and shares Hamas’s dedication to continued war against Israel. The Israeli Left, as well as the State Department and several European governments, has now embraced the unelected Palestinian Prime Minister Salaam Fayad’s plan to unilaterally declare Palestinian independence in Judea, Samaria, Gaza and Jerusalem in two years. 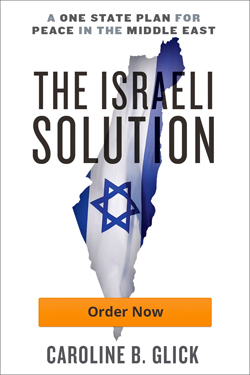 The aim of the Fayad plan is to coerce Israel into abandoning all the lands it took control over during the Six Day War, by implicitly threatening to deploy international forces throughout “Palestine” that will be charged with “protecting” the new Palestinian state from the IDF. dents of Judea and Samaria to within the 1949 armistice lines. But the fact is that there is no reason for Netanyahu to fear their plans. Indeed it is high time for Israel to call their bluffs. The shocking truth is that the demographic threat is an empty threat. The demographic doomsday scenarios for Israel are all based on falsified Palestinian census data from 1997 that inflated the number of Palestinians in Israel, Judea, Samaria and Gaza by 50%. As the independent American-Israel Demographic Research Group demonstrated in early 2005, Israel has no reason to be concerned that by maintaining its control over Judea and Samaria, it will become a majority Arab state. Today, the combined population of Israel and Judea and Samaria leaves Jews with a two-thirds majority. With Jewish immigration and fertility rates rising, negative Arab immigration rates, and decreasing Arab fertility rates, the long-term projections for Israel’s demographic viability are all positive. As Netanyahu knows, there is consensus support among Israelis for his plan to ensure that the country retains defensible borders in perpetuity. This involves establishing permanent Israeli control over the Jordan Valley and the large Jewish population blocs in Judea and Samaria. In light of the well-recognized failure of the two-state solution, Hamas’s takeover of Gaza and the disintegration of Fatah accompanied by the shattering of the myth of Fatah moderation, Israel should strike out on a new course and work toward the integration of Judea and Samaria, including its Palestinian population, into Israeli society. In the first instance, this will require the implementation of Israeli law in the Jordan Valley and the large settlement blocs. Replacing the military government in these areas with Israel’s more liberal legal code will also advance Netanyahu’s economic peace plan, which envisions expanding the Palestinian economy in Judea and Samaria by among other things reintegrating it into Israel’s booming economy. This plan would reward political moderation while marginalizing terrorists in Palestinian society. In so doing, it will advance the cause of peaceful coexistence over the long-term far better than the failed two-state solution. Far from engendering peace, the two-state paradigm empowered the most corrupt and violent actors in Palestinian society, at the expense of its most productive and moderate citizens. Obama’s disgraceful treatment of Israel and, for that matter, his atrocious treatment of the majority of America’s allies in the Middle East and throughout the world, has strengthened the hands of America’s worst enemies and made the world a much more dangerous place. But his obvious failures provide Israel with an opportunity to take control of events and change the situation for the betterment of Israel and the Palestinians alike. Applying Israeli law to the Jordan Valley and the major Israeli population blocs in Judea and Samaria will probably not win Netanyahu many friends in the Obama White House. But if we learned anything from Obama’s insulting treatment of Netanyahu and American Jews this week, we learned that regardless of what Israel does, the Obama administration has no interest in being his friend. As for Prime Minister Netanyahu’s treatment by imperial Caesar Hussein if a people or nation act like pushovers that’s what they get. Israel has overdone it playing the role of loyal lap dog and the dog is getting treated accordingly. It’s past time to change Israel’s role and image,that is if Israel is tired of being played for an idiot with the farce peace scam, tired of getting kicked around for nothing but lies in return ? Find a leader who is capable of removing the ‘KICK ME’ sign from Israel’s back side. For too long Israel has refused to act like the independent nation that it once was and happily plays the part of loyal lap dog to the US and it’s failed agenda.Even after ex-Foreign Minister Livni was shown the side door at Annapolis instead of demanding an end to this abuse Israel continued to ask for more of it. You are only getting what you settle for and it’s time to get off your knees and act like Jews who know their God instead of being idol worshipers who run to Washington to prostrate before the useless,corrupt,backstabbing,empty suits. Prime Minister Netanyahu’s economic peace plan for Yesha is a nice idea but it won’t work as long as anti-Israeli incitement continues. Even Israel’s more liberal legal code hasn’t been enough to integrate Israeli-Arabs into Israel’s society, because many sympathize with the PLO’s extremist agenda for Israel’s destruction. Mr. Netanyahu needs to recalibrate his approach in resolving the impasse with the PLO. As long as Arab intransigence continues, there will be no so-called peace process. And President Obama needs to concentrate on domestic policy, and let Israel manage its affairs. While I agree with Glick’s assessment of Pres. Obama’s and his administration’s anti-Israel thinking and policies, with her declaring the two state solution, current and past all deriving from the thinking behind the 1947 UN Partition Resolution, as an unworkable peace pardigm and with her calling Netanyahu’s seemingly anxious call for a return to peace negotiations with Abbas as being imprudent, I disagree with her analysis and solution. Glick begins with implictly discrediting an older demographic study which relied on falsified Palestinian census data from 1997, upon which study the Sharon and later Olmert government relied. Glick refers to a more recent American-Israel Demographic Research Group study and concludes that if Israel were to incorporate the Palestinians in Judea and Samaria into Israeli society at large, there would not be any fear that Israel would be bringing within its borders a demographic time bomb whereby Palestinians would in short time outnumber Jews in Israel. That conclusion is not without debate. Let’s assume however that Glick is correct that there is no demographic concerns with Israel incorporating the Palestinians into Israel. Glick then endorses Netanyahu’s economic peace plan, but says in order for Netanyahu to implement that plan he must implement a new policy that moves toward integration of Judea and Samaria, including its Palestinian population, into Israeli society which will first require Netanyahu to order that Israeli law governs the Jordan valley and the large settlement blocks in J & S.
What is wrong with her proposal is the same thing that is wrong with Netanyahu’s economic peace plan. It will not work, except against Israel’s best interests and there is much evidence in that regard. 1. Fatah calls for an independent Palestinian state that is Jew free. That call is being endorsed by not only Pres. Obama, but the majority world opinion, which also calls on Israel to recognize the Palestinian claim of a “right of return” to some meaningful extent at least. 2. Though Fatah departs from Hamas to the extent of calling for an independent Palestinian state existing side by side with Israel, Fatah openly endorses Hamas’ goals vis a vis all the land of Israel. Indeed, Abbas/Fayad are making intransigent uncompromising demands in conjunction with its call for an independent Palestinian state that make such state impossible given that it is impossible for even the most dovish of Israeli leaders to go along with, unless they are prepared to oversee Israel’s suicide. Fatah thus speaks out of both sides of his mouth in its call for an independent Palestinian state. 3. Israel already has within her recognized borders many Israeli Arab citizens (not all of course), many of whom have in a number of ways declared their allegience to the Palestinians and Arab nations over Israel from whom these Israeli Arab citizens take much. Israel’s adherence to democratic values has also incorporated multicultural ideology into its political/social fabric that compels Israel to tolerate the intolerantly anti-Israel Arab Israeli citizens within her midst. Not only has Israel tolerated this intolerant faction of anti-Israel Arab Israeli citizens, Israel has recognized and accepted this fact by not requiring or is it not allowing Israeli Arabs to serve in the IDF. Israel thus already has a significant 5th column of anti-Israel Arab Israeli citizens in her midst. She needs no more, whatever legal status and legal rights are accorded the Palestinians by Israel in Glick’s peace scenario. 4. Glick overlooks and does not therefore factor into her thinking the intractable Jew hatred of the large majority of Palestinians which various opinion polls show are pro-Hamas and Israel’s Middle East Muslim intractatably Jew hating neighbors. 5. Glick completely ignores that Israel has already over many years done much to improve the lot of Palestinians under occupation and all Israel has received from the Palestinians for that is even more intense intractable contempt and hatred of Palestinians and her Middle Eastern neighbors, which contempt and hatred is not only ignored, but tactily endorsed by world opinion. World welfare contributions to Palestinians also have not had the desired effect, though the world continues to give. 6. One of Israel’s strengths lies in the fact that the totalitarian repressive Arab regimes and Palestinian leadership in order to maintain control and authority over their people, have deprived those nations and societies from advancing economically and rendered these societies unstable, which leaders seek to contain by totalitarian repression. In the Palestinian societies in Gaza and the West Bank, that instability has seen much violence and discontent break out into violence within those regions as well as violent clashes between Fatah and Hamas as well as their Jew hatred breaking out into armed hostilities between Israel and the Palestinians. Netanyahu’s economic peace proposal is just a restatement of past Israeli policy to improve the lives of Palestinians. It has not worked until now and there is no reason to believe that it will hereafter. Whatever makes Netanyahu and Glick think that this time it will be different, is reminiscent of the classic definition of insanity which is doing the same thing and failing over and over again, but holding fast to hope that this time the outcome will be different. The transformation of America into a totalitarian,Marxist, Bananna Republic while the citizens sleep and play. The U.K. is already there. So Obama was insulting to the Jewish American leaders.They brought this on themselves.Instead of paying attention to where this man had been and who his teachers were they chose to follow the path of leftist-political agenda. For too long the majority of Jewish Americans ignored the anti-semitism of the left dismissing it as not important. Now it comes full force in their face and they wonder what happened. So much for Jewish intelligence. Also I have another take on the meeting with Obama and the so-called Jewish leaders. It was not as you say, stay out of foreign policy, it was a threat. If the Jews don’t help him pass his economic and health plan agenda he is going to take it out on Israel. The same with Netanyahu. Obama is threatening Israel with abandonment if they don’t support his vision of Middle Eastern peace. Of course that his version of peace calls for Israel to be vulnerable to annhiliation is too bad for the Jews. Pure and simple. Sometimes there is nothing between the lines. Barack Obama has shown that he is just about as useless at imposing negative consequences as he is about making serious decisions, thus I feel that Israel has little to fear from Obama’s antagonism, except for a diplomatic slight here and there. What is more troubling to me is Obama’s paralysis in decision making in general, he can’t even decide to send a few thousand more American soldiers to Afghanistan to help secure the safety of the troops already there nor can he seem to decide that America’s number one enemy, Iran, will have to be confronted at least by economic sanctions, and probably by military action as well. Of course this sort of behavior should be expected from an individual like Obama, one who has never had to do anything more difficult or complicated than ask for a government loan or a scholastic grant, or organize a demonstration to blackmail some large Chicago corporation into funding an African American day care center. And to make matters even more tragic, we all have three more years of Obama’s gross incompetence to lead and his predilection for blaming everybody but himself. Israel needs to look after the health, education, welfare and well being of another 2 million Arabs like it needs a hole in the head. The only way forward is to bring Jordan back into the West Bank and divide sovereignty of the West Bank between Israel and Jordan in direct face to face negotiations. Sorry Caroline I think you have got it very wrong this time. By this time, everybody should realize that this American President had never run so much as a Dairy Queen restaurant prior to assuming responsibility for the office to which he was elected. His treatment last week of the Israeli Prime Minister was shameful. As I read these dispatches, I wonder to myself what people like Senator Richard Lugar and others with real foreign policy expertise and who understand the dynamics of the Middle East peace process must be thinking? I agree with some of the other postings — Israel should strike out on an independent path and do what they know is right and just for all parties involved regarding the Iranian nuclear program. I can only assume that the Saudis, the Egyptians and perhaps other tacet players in the region would secretly support whatever Israel does. Some of us are ashamed of what a shambles this President is making of U.S. foreign policy regarding the Middle East. Coddling those who support and finance terrorists who delight in killing and destroying property in Israel is simply not a position the overwhelming majority of American citizens support. It is also time for American Jews to come to their senses. While 78 per cent of them voted for Obama, he is very much taking them for granted the same way Democratic politicians have treated blacks in this country since the days of FDR. I read elsewhere that many Israeli citizens are viewing Obama as a one term president. Many Americans are too — he may well be facilitating the largest political reallignment in the history of this country. Obama’s word Sunday,Nov 15th headlines across the global media on dealing with Iran. His words are deeply prophetic when you have eyes to see that Iran (and her RED allies) is the rider on the red horse of Revelation 6:4 which takes peace from the earth. Read Obadiah,Habakkuk,Isaiah47.Jeremiah 51 to understand the trap God has laid for America Babylon and her cursed president Fool Obama. Israel will go cold turkey in one hour from her addiction to her replacement god on the Potomac. The way,the delusion has been prepared for all who hate the Holy One of Israel. After this war and ensuing great tribulation the survivors will be looking for a messiah to save them,a false messiah. Prime Minister Netanyahu should not count on President Obama or America in general, for any support whatsoever. I can only hope the PM is wise indeed about this. Many of us Christians in the U.S. are supporters of Israel. We pray for Israel on a daily basis and pray for the peace of Jerusalem – Psalm 122:6. We know the Word of God and His plan for all Israel. It is He who redeems Israel and fights for her to the praise of His glory. As far as our President is concern, many of us believe he is the one God has raised up to bring judgment on this nation for its 100-year plus rejection of Him. In addition, we believe God is in the process of cursing our nation because we have cursed Israel – Genesis 12:3. Let me emphasize again, Israel must not look to America or anyone, for that matter, for help. Yahweh is her help and redeemer. Obama is also the first US President to refuse to meet the Dalai Lama during the latter’s visit to Washington DC for fear of offending his Chinese overlords. Obama’s O-beisance is appalling. Caroline since I am not that familiar with the history and politics of Israel I will not comment. Having said that, I am appalled the 50 Jewish leaders would allow themselves to be treated with disrespect. Look by now they must realize this community organizing acorn Muslim president is anti-Semitic. Time to get off the obama band wagon . I am a FOX News junkie and I look with disgust, I am willing to bet that over 90% of the democratic-obama strategist are Jewish. Now I am beginning to understand what the folks at Israpundit mean when they refer to American Jews as “self-hating Jews”. How can they in good conscience even support this character, an anti-Semitic who is supporting the enemies of Israel. There is something wrong with this picture. If I were Jewish I would disconnect quicker than you can shake a stick and I would go out and work against him and his colleagues to be sure they will not be re-elected to office. Time for these so called Jewish leaders to work together and pull all the Jews in this country to get behind them in support of Israel. They should have no problem gaining support from the non-Jewish Americans. It’s a plan, let’s get it started now. In response to Marcel, yes, many of our citizens in the US “sleep and play” but I think many more are appalled at the Obama administration. His arrogance and insults against Israel are sickening (in fact, some of us believe he is actually a Moslem, if anything – certainly not Christian), but he is also insulting many other of our friends. I hope Israel has the good sense to ignore him completely and do what is best for its own people.